Renowned for their dark takes on comic books, including The Spectre, Martian Manhunter, Batman Grotesk, and The Kents, John Ostrander (Star Wars: Legacy) and Tom Mandrake (John Carpenter’s Asylum) have launched crowd funding campaign to help bring their latest creation to life in a new graphic novel Kros: Hallowed Ground. War is hell and vampires have brought their own hell to the war between the North and the South. By day, the armies of both sides clash in bloody conflict: by night, the vampires emerge to feast on the wounded and the dying as Blood calls to Blood. 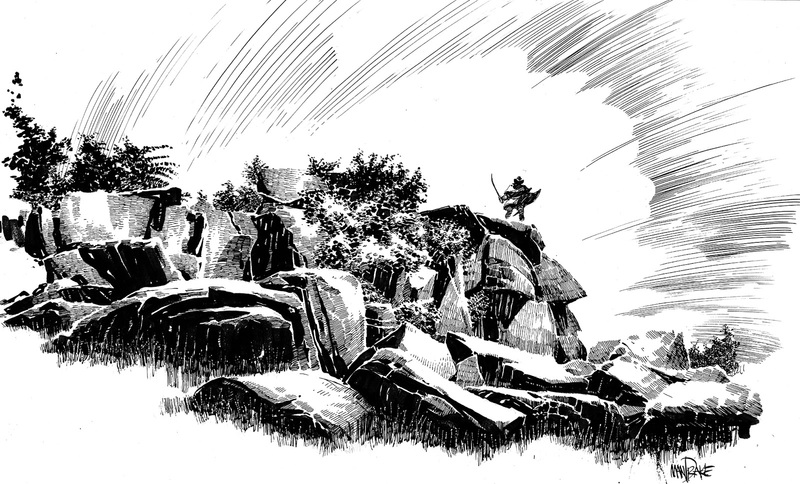 Read on for more details on this project and how you can help make it happen, and then scroll down to view some new artwork that Mandrake has created for the graphic novel! Against this army of hungry undead rides one man, a vampire slayer known only as Kros. Alone against a vampire army, Kros, a dampyr with an inborn hatred of vampires, knows that if he fails he could become one of the creatures he loathes. Renowned for their dark, chilling stories on The Spectre series for DC Comics, as well as for their runs on Martian Manhunter, Batman Grotesk and The Kents, Ostrander and Mandrake are are thrilled to be collaborating once again on KROS: HALLOWED GROUND. 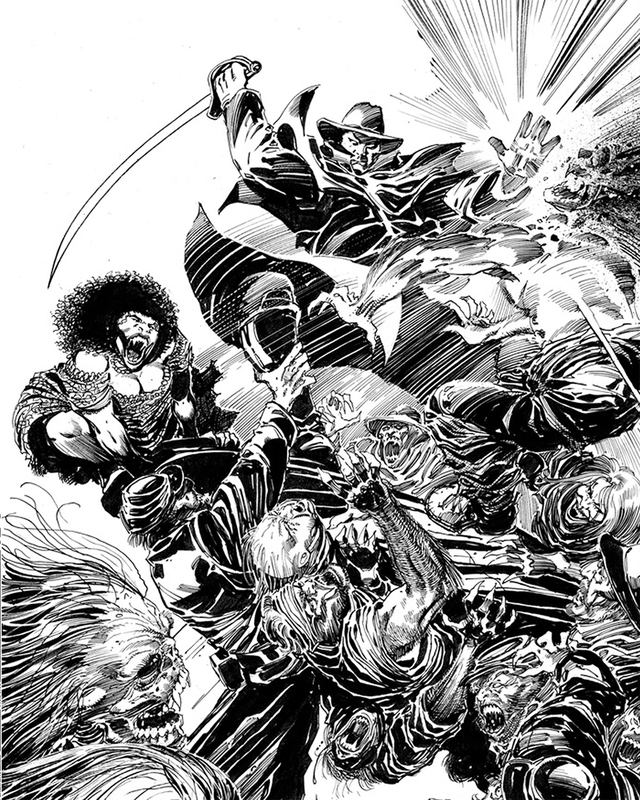 Ostrander and Mandrake are funding KROS: HALLOWED GROUND through Kickstarter because they want to bring their fans and readers the kind of story that is not often seen in mainstream comics. 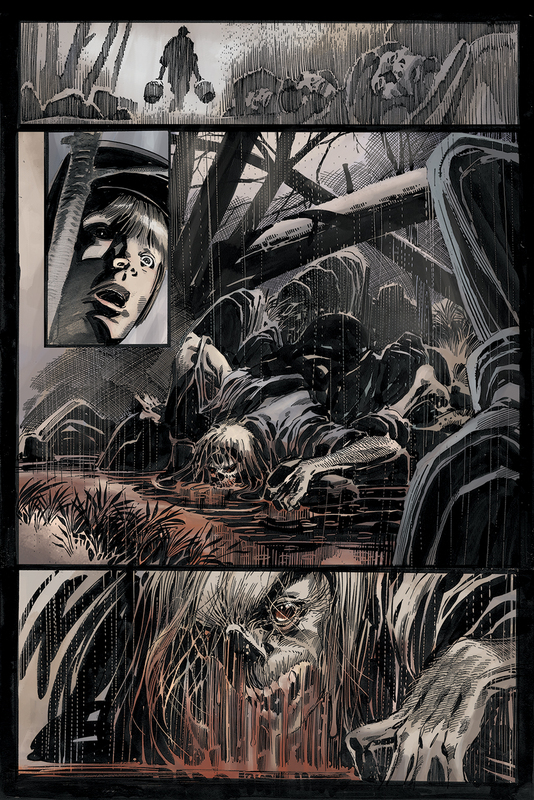 KROS: HALLOWED GROUND is a tale of supernatural obsession, the horror of war and of the monster lurking within humankind. KROS: HALLOWED GROUND is a graphic novel created by John Ostrander (GrimJack, Suicide Squad, The Spectre, Star Wars: Legacy) and Tom Mandrake (The Spectre, John Carpenter’s Asylum, Lance Henrikson and Joe Maddrey’s To Hell You Ride). John Ostrander’s haunting story of obsession and vengence features darkly atmospheric and brooding artwork and cover by Tom Mandrake. You can get involved and help fund the project by checking out the Kros: Hallowed Ground kickstarter page here. You can also learn more about the project at the official Facebook page here.